To provide a framework through which the church, as an organization, can make manifest our core Unitarian Universalist principles. To raise awareness of our religious community within the outside world as an organization of people committed to higher ideals not only in words but in action. To responsively serve the wider community by promoting the core principles widely accepted by Canadian Unitarian Universalists. These are some of the past newsletters for this year. Well, it took a year and a half but finally on October 19 Art Brewer, member of Toronto First and Chair of the CUC Gender and Sexuality Monitoring Group, a man willing to drive four hours on a Sunday morning for a contribution toward the cost of his travel, spoke to us on one of the subjects of his heart. Early in my sabbatical time in the first five months of 2007 Art called me and asked if he might some time speak at Olinda. I thought it a great idea, having considered the possibility in my own head already! I responded that some time after the beginning of the next church year would be good and we decided on a date after the depths of winter would be best so that he wouldn’t have as much chance of driving problems; we chose March 9, 2008. As luck would have it, one of the biggest snow storms of the season was THAT week-end and Art only made it as far as Woodstock (or should I say Woodstuck?) where he spent the night and then turned around to drive in even worse weather back to T.O. The weather that stopped him also stopped Olinda from having any service at all even though I had Art’s manuscript to preach myself – this decided after meteorologists were suggesting we might have a problematic week-end. Blessedly, October 19 only brought falling leaves and they are generally no problem to drive through. For me it was a wonderful scene to witness Art walking through Olinda’s parking lot toward the church building! Art not only spoke on a subject of his heart but he spoke of it from his heart, teaching us how we might think of gender and sexuality in fresh ways, informing us of the lives of the GLBT (Gay, Lesbian, Bi-Sexual and Transgendered) communities in Canada (including examples of terrible occurrences in the GLBT world in communities close to us), and giving us a good insight into the process of working on the program “The Welcoming Congregation”. 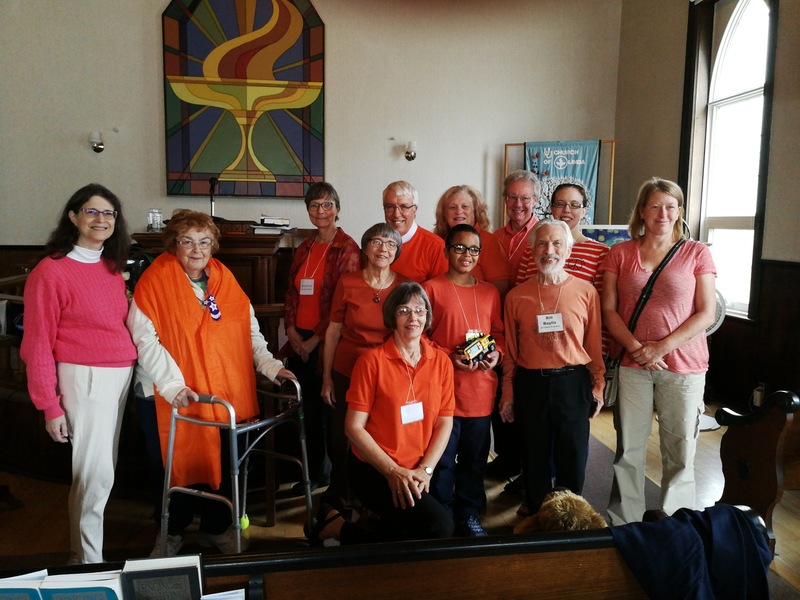 As we sang Holly Near’s words together, “We are gay and straight together” that morning and listened to Art Brewer’s fine words, we learned more of the intricacies of being gay and straight together. As Olinda begins the work of this program, we’ll learn more about the being a community of welcoming everyone. So may it be that we also learn the deeper arts of being welcoming in all ways, as singer/songwriter tells us – “young and old together”, “a land of many colors”, gentle, angry and loving and always “singing for our lives”.